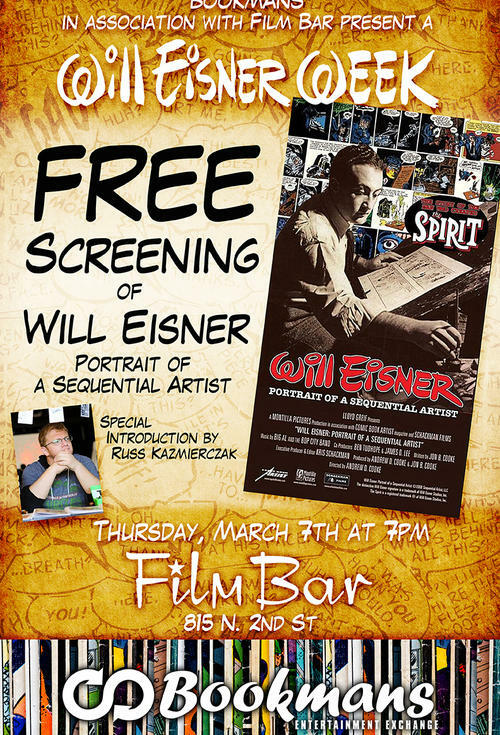 Bookmans is proud to present, “Will Eisner, Portrait of a Sequential Artist” as part of Will Eisner Week. Will Eisner Week is an Annual Celebration in March promoting Comics, Graphic Novel Literacy, Free Speech, and the Legacy of Will Eisner. Join us for this free screening on Thursday, March 7th at 7 PM. We encourage you ticket reservations to ensure a seat, however, we will allow for walk-ups if seating is available. Special Introduction by Arizona artist, Russ Kazmierczak: Russ Kazmierczak, Jr. is the creator and self-publisher of Amazing Arizona Comics, a minicomic book that has satirized local news, history, and culture since 2010. He's the Phoenix New Times Best Storyteller of 2018 and the organizer of the Valley's annual Jack Kirby Birthday Celebration. Follow him on Instagram @amazingazcomics. Arguably the most influential person in American comics, Will Eisner, as an artist, entrepreneur, innovator, and visual storyteller, enjoyed a career that encompassed comic books from their early beginnings in the 1930s to their development as graphic novels in the 1990s. During his sixty-year-plus career, Eisner introduced the now-traditional mode of comic book production; championed mature, sophisticated storytelling; was an early advocate for using the medium as a tool for education; pioneered the now-popular graphic novel, and served as inspiration for generations of artists. Without a doubt, Will Eisner was the godfather of the American comic book.